If you’re new to the sport of skateboarding or are getting a skateboard for a beginner you might want to check out the complete line of skateboards from Positiv Team. They produce a line of quality complete boards that are designed to withstand the wear and tear of the beginner as well as the more seasoned skater who just might want to knock around a bit. The skateboards are based on the Positiv Team that consists of Andy MacDonald the leader of the outfit as well as Rodney Jones, Sandro Dias, and Carlos de Andrade. These dudes hooked up their talents and put out these decks complete at affordable prices so that newbie could just hop on and ride. Trucks at a width of 7.625. These dimensions and specs are fine tuned and some standard that allows for the fun of not just riding but also doing those tricks and stunts that make skateboarding part of the extreme sports circuit. When going out to skateboard you want a deck that is reliable because you don’t want to end up in a hospital or injure someone else. The guys who developed the Positiv line of skateboards know inside and out what a good deck is supposed to be made of and how it should perform. They set out to produce a line of skateboards that are constructed well and perform as top notch as the other pro level boards. These aren’t just for cruising down the street looking cool, these are for beginners and experienced to use either recreationally or even competitively. They’re easy to customize and maintenance as well as promote the positive message. This line of skateboards has been kicking for over four years now and has proven themselves. They’re manufactured by renowned company Skate One who has been producing skateboards for over 30 years now. This line of boards has a price tag of up to $75 but many can be found far lower with just a bit of shopping around. Users around the world who’ve gotten one give them high fives. It’s because the boards are designed by skaters, manufactured by skaters and that calls for a higher level of control and quality than the standard stuff you get at toy stores. 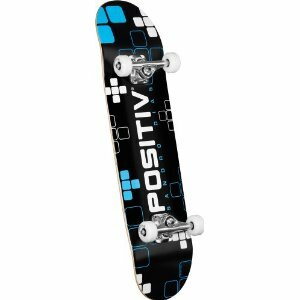 The Positiv Team knows their reputation would be zilch if they turned out a completed skateboard that didn’t cut the mustard. They would be in such trouble no one would listen to them again, however, they’re four years going strong with this new line for Autumn 2011. So it’s a good bet that you or whomever you buy one of these Positiv Team completed skateboards for is going to love it and ride with fun and confidence. This entry was posted in Positiv, Reviews, Skateboarding, Skateboards and tagged Andy MacDonald, Carlos de Andrade, Positiv Team, Rodney Jones, Sandro Dias, Skateboards. Bookmark the permalink.